The ‘Trails’ project, used as an excuse to remove over 30 trees, is well under way in Glen Canyon. The hillside is getting covered with staircases. Earlier, there were gradual sloped trails, punctuated with short sections of shallow steps. Now, there are wooden box steps, installed at considerable expense, supposed to make access easier. If you happen to be one of the lucky people with a lot of stamina and a stride that matches the pitch of the steps, that may actually be true. But people we spoke to find they’re tiring and hard on the knees. Instead of being able to determine your own step length, it’s determined for you by the staircases. 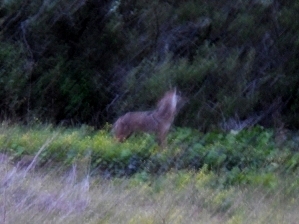 Here’s the article ‘Glen Canyon with Stairs and Coyote’ from the sfforest.org website, being republished here. This is one of our “park visitor” series – first person accounts of our parks, published with permission. It was dusk when I climbed down into Glen Canyon from the Christopher Playground. It’s been some months since I visited it last, and I was saddened by the changes stemming from SF Recreation and Parks “trails” project. 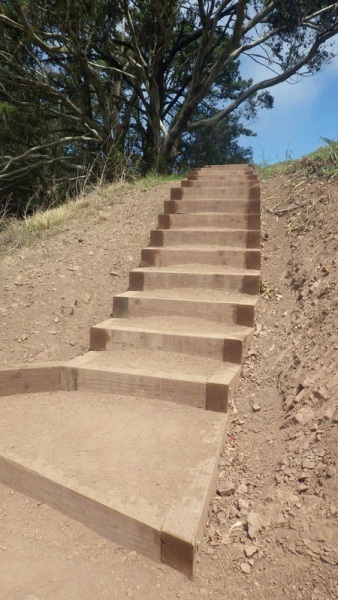 All the hillside trails have been made into staircases. 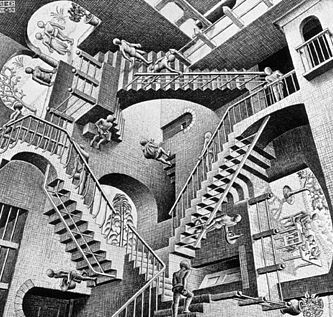 It reminded me of a drawing by Escher: they’re nearly as as difficult to walk. The risers of the box steps are high and the pitch not suited to everyone. Tiring and hard on the knees, and so it will effectively restrict access to many people. The park is surrounded by urban areas, and an emergency vehicle was racing by on the street above, siren wailing. “Watch,” said my companion. “He’s going to howl with the siren.” And sure enough – the little coyote raised his muzzle to the sky, gave a few barks, and then howled along with the siren. I managed to get a blurry photograph. A few dogs from nearby homes responded with a woof or two, but they weren’t serious. The siren-coyote duet continued until the vehicle raced away and the sound faded. The coyote sat down, convinced, I thought, that it had told off the intruder into its territory and announced who really occupied this space. The dusk deepened, and this magical moment was broken by flights of mosquitoes. I’ve been to Glen Canyon many times over many years, and these are a new thing for me. Wonder if it’s anything to do with the Islais Creek – and the felling of the bat trees.